Description: Mimulus fremontii is an annual herb with a thin stem. The tubular base of the flower is encapsulated in a wide, ribbed, hairy calyx of sepals with pointed lobes. 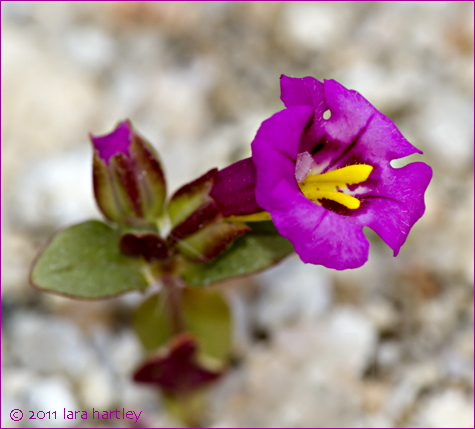 The corolla of the flower is reddish-purple with a darker pink throat with a yellow spot. There are occasionally all-yellow flowers. The flower is one to two centimeters in length. Leaf: The oval leaves are up to 3 centimeters long, the ones higher on the plant are hairy in texture. 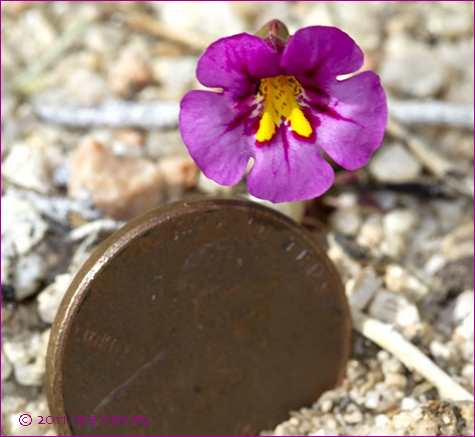 Notes: Mimulus fremontii, a dicot, is an annual herb that is native to California and is also found outside of California, but is confined to western North America. Distribution outside California: n Baja California. This photo was taken on April 3, 2010 in Joshua Tree scrub along Kelso Creek, Kelso Valley, Kern County, California.